There is no better race than when the best cars all seem to end up bumper-to-bumper right up front with just a few laps to go. And even though the final results of Monday night’s 25-lap Modified feature at New Smyrna Speedway will show that there wasn’t a single-pass for the lead, anyone in attendance will know it was the most exciting Tour Mod race of Speedweeks thus far. Lia spent most of the night pounding on Christopher’s bumper while trying to grab the lead. The two made contact several times, wearing out front and rear bumpers. The whole time, Hossfeld was picking his way through the field and near the end, found himself just behind the two leaders ready to pounce. A green-white-checkered finish put the three in a two-lap battle, but no one had enough power to make a move over the next, and they finished one, two and three, just how they’d been running most of the night. “Sometimes (the pole) is the hardest place to win from here,” said Christopher, who sat on the pole after the redraw on Monday night. “We made a bunch of adjustments tonight. We were one way one night; we were another the next night. We’ve been searching. There is no way to judge in what you are doing. Today, we were way too tight. “A couple of laps I’d give myself some breathing room then it would tighten up and it slows the car down. We’ve got good s--t. Donny’s got good s--t. Chuck’s got good s--t. They all got good s--t. If you hurt yours for 20-percent, it is hard to stay up front. The best cars all week long have been those of Ted Christopher, Chuck Hossfeld, Donny Lia and Eric Beers. TC and Hossfeld each have one win and Lia should have had one be it not for mechanical problems while leading on opening night. Beers hasn’t been as fast as the other three, but has finished second in both races thus far. On Monday night, TC, Hossfeld and Lia all showed again that they were the best cars in Smyrna, at least so far. With TC on the pole, Lia starting third and Hossfeld seventh, they all worked their way to the front and battled nose-to-tail over the waning laps in Monday night’s race in an exciting showdown. Again, the battle was between TC and Lia, who have a huge rivalry brewing. “Donny has good power in that thing. Our motor is pretty good too though and that saved me. I got him on restarts. My restarts worked. You just learn stuff throughout the years. Lia had a couple of shots to get TC during restarts, but a couple of key moves by TC kept Donny at bay. “I got a good restart both times on Ted,” said Lia . “Good enough to do something with him on the outside, but he just ran me up (to the wall). I just rolled out of it. I could have stayed in it. But it is still early in the week. If he wants to make right turns on restarts… whatever. There are five more nights. “I’m happy I got a good finish. I’m really not pissed. It feels real good. We got the win taken out of our sails after being so fast there early. I think we got everything we need back now as far as moral. It is the most comfortable the car has been since we’ve been here. For Hossfeld, most of Monday night’s battle was just getting through the field so he even had a shot at TC and Lia. He got there and even pulled up beside Lia to battle him on the last lap, but had to settle for third. “Unfortunately, we qualified third and that is where we ended up,” said Hossfeld. “When we redrew 7th, I knew that would be a little bit tough because it is so competitive here and we’ve got a lot of good guys. The problem is that we are so close and that makes it hard to pass. You have to be a lot better than someone to pass them here. So I try to do it on the restarts and I was fortunate enough to be in some of the right lines and get by some guys on the restarts. Lia (#18) was hounding TC (#00), but could never make it by him. With two wins, TC is now the man to beat. 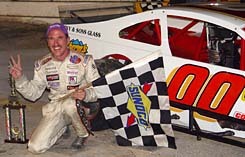 And Hossfeld wasn’t too worried to see TC pick up win number two during Speedweeks. 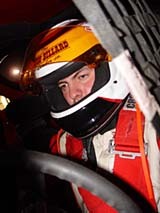 Despite getting into it with Kevin Goodale and getting gouged out of the way by Chuck Hossfeld late in the race, defending Mod Tour Rookie of the Year Zach Sylvester had his best run of Speedweeks thus far, finishing fourth after qualifying fourth as well. “It was exciting,” said Sylvester. “It is about time we finished it off. The other night, it was nothing by a melee. It has been rough since we got here. We’ve done about four motor changes. As for getting moved out of the way by Hossfeld while running third. And Hossfeld seemed a little surprised by it as well. 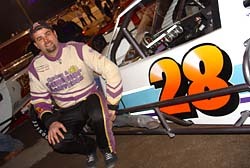 After two pretty impressive fourth-place finishes on the first two nights of Modified racing, Kevin Goodale hit his first snag of the entire Speedweeks on Monday night. Goodale, who qualified fifth and started on the outside pole after the redraw, looked as if he was going to have yet another top-five run going until getting bumped by Zach Sylvester coming out of turn two on lap 12. “The car was loose as it was,” said Gooddale. “We tried a different set-up tonight. It worked for a few laps, but we were too slow after that. 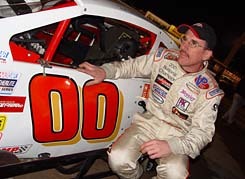 Glen Tyler, a regular Late Model racer from Riverhead, is taking his first shot at Speedweeks Modified racing in 2005. And after a few struggles, a 10th place finish on Monday night was just what the doctor ordered. Tim Arre’s night didn’t last very long. The veteran who has struggled in the #14 car this week pulled behind the wall and retired after just six laps in the Mod race with mechanical problems. Arre’s night did get better in the SK mod feature, as he took the wheel of the Zacharias #71 and cruised to a victory. He beat Tom Farrell to the line in a green-white-checkered finish. Brad Vanhouter and Jim Storace each had other team’s backup cars out on Monday, just taking laps and pulling in to get the start. Vanhouter was in a backup to Kevin Goodale, while Storace was in a backup Joe Brady car. “We are not really where we need to be,” said Tyler. “We are a new team and we are trying. You don’t just learn things over night. I think the car will be pretty good by the time we get out of here. It seems like things are turning around. “We had a clutch problem tonight. That cost us some spots on restarts for sure. Jonothan McKennedy was able to come home with a solid seventh-place finish on Monday night, but that will do little to help him fix his torn up race car. As the cars came across the line to get the checkered flag, McKennedy’s car spun sideways and slammed into the outside wall, making its trip back to the pits on the rear of a wrecker rather than driven by its driver.